Bandcamp and other music stores. Not written anything for a day or two which is rather frustrating. The reason is marketing, at least my ham-fisted attempts at it. 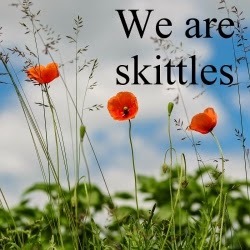 The target of my marketing efforts is, of course, We Are Skittles - and you can read all about the song and watch the YouTube video by clicking the page above or by going here. I'm not a complete stranger to marketing's dark arts. In fact, up until now, I had thought I was rather good at it having pushed the sales of my partner's memoir, No Easy Road, from a few local sales to something around 100,000 sales on Amazon's Kindle platform. But marketing music is a whole different ballgame. It's much harder simply because there's so much more competition out there and, to really make inroads, you've got to spend a little cash. In fact, the more you spend the easier it becomes, assuming the product is good enough in the first place. One of the biggest problems any would-be marketer has to overcome, no matter whether it's a song or a book, is separating the wheat from the chaff, particularly if you intend turning to all things online, which is what most people do nowadays. There is literally a plethora of websites all claiming to provide all manner of opportunities - for a price, of course. You could easily end up spending a fortune and still be little further forward. That's where doing a fair bit of research, prior to parting with any money, becomes ever-more vital, especially if the budget is a little bit on the low side to begin with. I think I've stumbled on a pretty good website where, for a few dollars or so, you can get your song in front of music-industry specialists who'll take a listen and give you a fair and accurate review. The website, New York-based Music Xray, appears to be the real deal - at least that's my initial impression. But we'll see what happens over the next weeks and months. Two points to finish with: I'm not a Music Xray affiliate; and, you've guessed it, I'll keep you all posted over any developments!